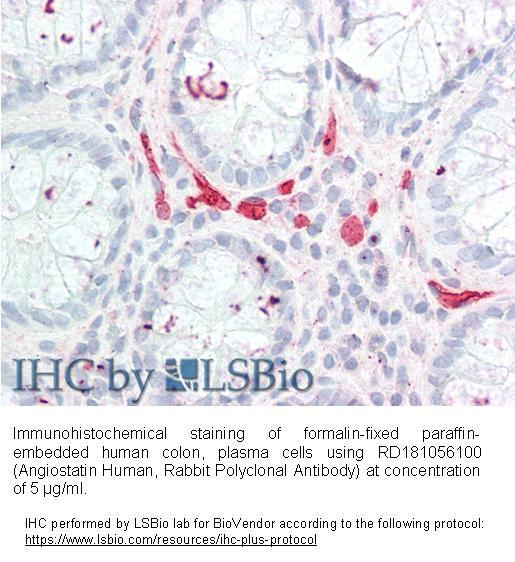 The antibody was raised in rabbits by immunization with the Human Angiostatin from human plasma. The Human Angiostatin contains Kringle 1 – 4 and part of 5. Immunoaffinity chromatography on a column with immobilized serum Human Angiostatin. Angiostatin, an internal fragment of plasminogen, is a potent inhibitor of angiogenesis, which selectively inhibits endothelial cell proliferation. Angiostatin potently inhibits tumor growth and can maintain metastatic and primary tumors in a dormant state. It is defined by a balance of proliferation and apoptosis of the tumor cells and is composed of plasminogen first four cringle structures. This molecule is generated by proteolytic cleavage of plasminogen. Recombinant angiostatin has 260 amino acids, residues 97–357 of human proplasminogen, and a calculated molecular mass of 29.8 kDa.